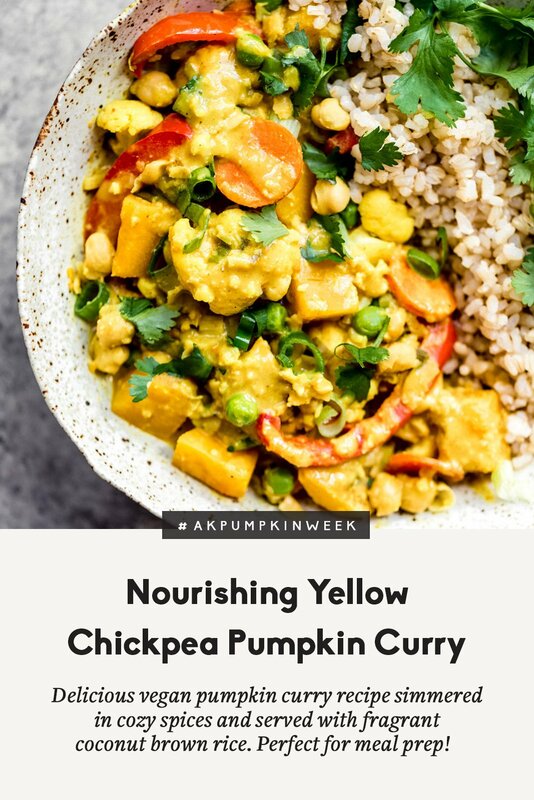 I’m back again with another glorious recipe for #AKPumpkinWeek! Yes, we’re going savory again and I’m not mad about it. I hope you aren’t either. This year I told myself that I wanted to incorporate more savory recipes into Ambitious Kitchen — you know delicious weeknight dinners you can always depend on to make you feel creative, healthy and satisfied. 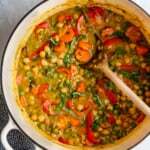 So here we are with a beautiful chickpea pumpkin curry. My oh my is it GOOD. No wait, not just good, it’s DAMN good. FANTASTIC. CREAMY. COMFORTING. FULL OF UMAMI FLAVORS. EPIC. A MUST MAKE. 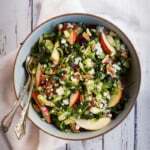 I was so thrilled when I first developed this recipe because of how nourishing it was. It’s full of anti-inflammatory ingredients, fiber, plant-based protein and just so happens to be both vegan and gluten free. Fresh cubed pumpkin: If you’ve never cooked a real pumpkin before, I suggest giving it a try. (And no, you don’t cook the pumpkins you decorate for Halloween!) I love to use pie pumpkins or a sugar pumpkin, but really, any winter squash will work. Check out my how to cook and dice a pumpkin tutorial here. Of course, if you can’t find a pumpkin, you can always use butternut squash. Chickpeas: Always a favorite legume of mine because of their delicious flavor and ability to add plant based protein to any dish. 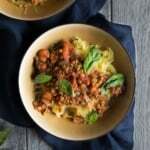 Lots of veggies: Not only does this recipe involve pumpkin, but also cauliflower, carrots, red bell pepper, green onion and peas. So yes, it’s time to #eatyourveggies. Light coconut milk: I like using a light canned coconut milk in this dish because it’s not as rich as regular full fat coconut milk. There’s still a lot of coconut flavor though. Peanut Butter: To bring the dish together, you must add a little peanut butter. It gives the recipe a unique umami flavor that helps to bring everything together. If you’re not into peanut butter, try cashew butter or even tahini. The anti-inflammatory trio aka garlic, ginger and turmeric: Not only do these three bring flavor to the dish but also help to boost your immune system with health benefits. Ginger is great for your digestive system, garlic helps fight bacteria, and turmeric provides an anti-inflammatory boost. I’m in loveeeee. 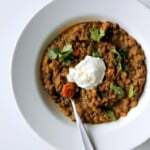 This recipe includes a fabulous coconut brown rice to pair with the curry, but you could always enjoy it with quinoa or on it’s own. You’ll get a big serving of cozy comfort food that’s delicious and great for cold season! I hope you love this recipe as much as I enjoyed it. xoxo! 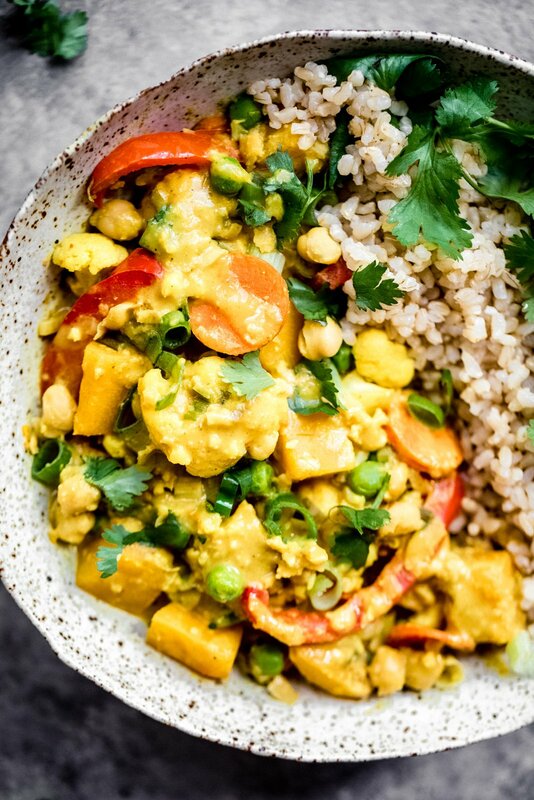 Nourishing yellow chickpea pumpkin curry simmered in cozy spices and served with fragrant coconut brown rice. 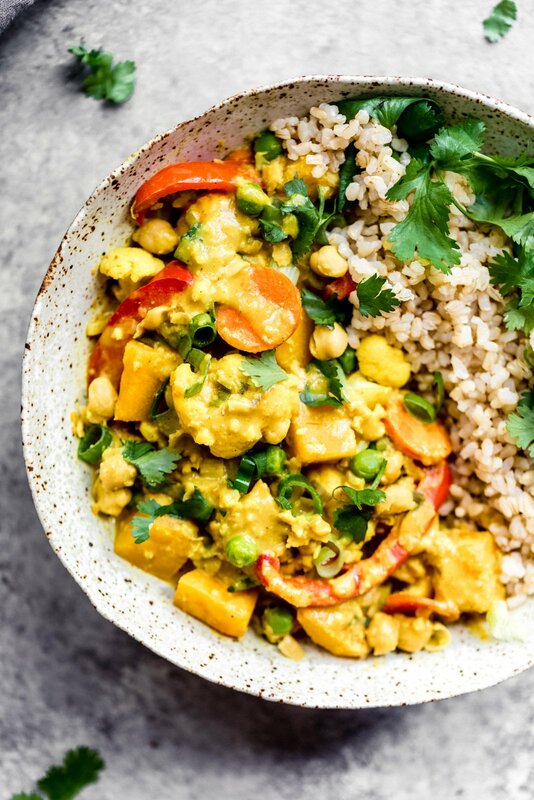 This vegan curry recipe is packed with protein and perfect for meal prep! To make the brown rice: Add one cup of brown rice to a pan along with 1 teaspoon of coconut oil. Toast rice over medium heat for 1 minute until fragrant. Next and 2 1/4 cups of water to a pot; bring to a boil, then reduce heat to low, cover and simmer for about 45 minutes. After 45 minutes, remove pan from heat and allow rice to sit in pot with lid on for 10 minutes. Place a large pot over medium high heat. Add in coconut oil, garlic and ginger and cook for 30 seconds, then add in green onion, carrot, cauliflower florets and cubed pumpkin. Saute for about 5 minutes until cauliflower and pumpkin begin to soften a bit. Next, add in curry powder, turmeric and cayenne; cook spices for 30 seconds before adding in coconut milk, broth, peanut butter, soy sauce/coconut aminos and salt and pepper; stir well to combine. Allow to cook 5 minutes more, then stir in bell pepper and chickpeas; simmer over medium-low heat for 10 minutes. Before serving, stir in frozen peas and simmer an additional minute, then taste, and adjust seasonings as necessary. Pour into bowls or divide into meal prep containers. Garnish with cilantro and chopped peanuts. 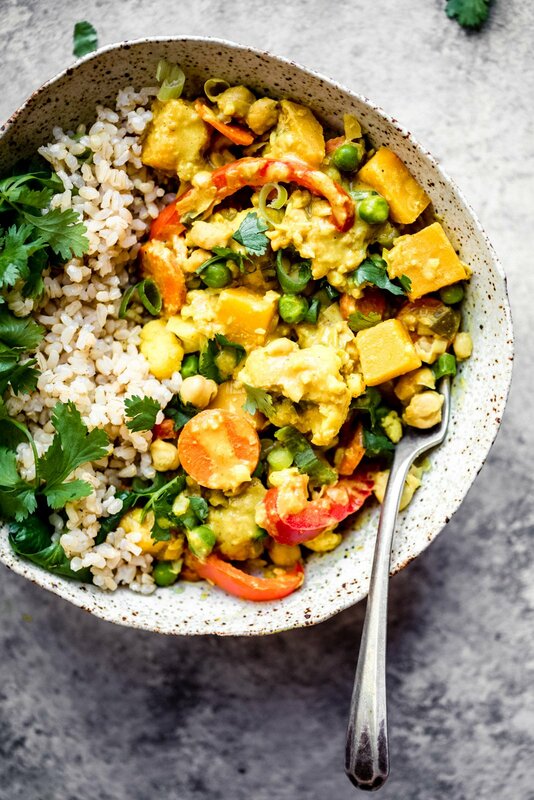 46 Responses to "Nourishing Yellow Chickpea Pumpkin Curry with Coconut Brown Rice"
Could I use canned pumpkin to save time? The pumpkin is actually cubed in this recipe, so I’d suggest pre-cubed butternut squash or pumpkin if you can find it. This recipe looks so delicious & comforting! Mmmm! This sounds so tasty!! Paired with the coconut brown rice too! So cozy and flavorful! The coconut brown rice is a game changer. Did you take the red bell pepper out of the recipe or am I just missing it? This looks so good…one question, however. How noticeable is the peanut butter? It seems like it would be subtle given the other flavors? It’s very subtle – just adds a delicious, savory/umami flavor to the curry! 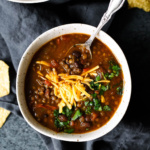 Would you be able to make this in a crock pot or would it make the vegetables mushy? 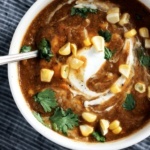 I’m planning on trying this in a slow cooker later this week, I’ll report back! It worked just fine! I cooked on low 8 hours…veggies were a little mushy, especially the pepper, but it tasted great! if you could shorten the cook time or put the peppers in at the end, it would be perfect! I also did cook the rice separately to avoid overcooking. I think it would be okay on high for 2-3 hours or on low for 5-6 hours. I’m about to make this now, and I wasn’t sure if I should roast the cubed pumpkin before adding to the pot? Nope it will cook in the pot! Made this last week and it was SO GOOD. I used delicata squash and it was perfect!!! Thanks!!! Amazing! Happy to hear that! Another delicious savory recipe, Monique! There is a lot of chopping, but it’s all worth it. This is great! 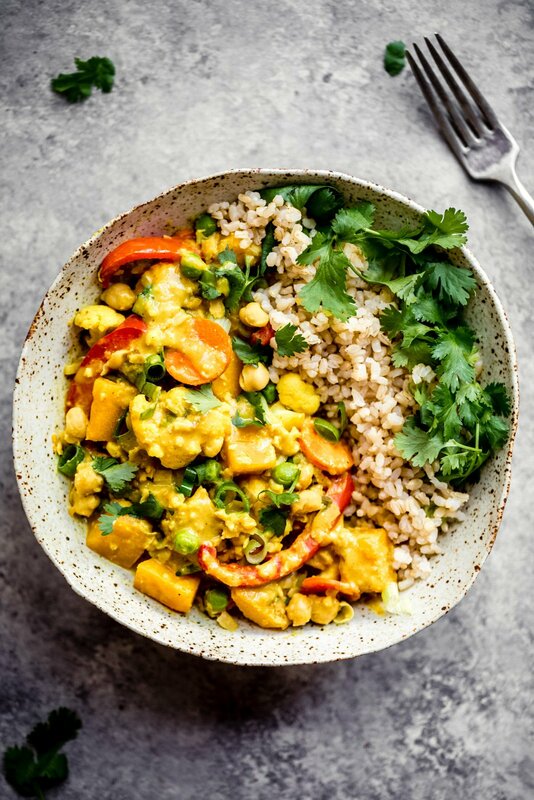 I’m wondering though – what yellow curry powder do you use? I can’t find one, and have been using an Indian curry seasoning that has turmeric, coriander, cumin, lemon peel, black pepper, cardamom, cinnamon, garlic and cayenne. Glad you liked it Connie! I use McCormick yellow curry powder here. I’m alllergic to nuts/peanuts… to substitute with tahini, would you still suggest 2 tablespoons? Yes that will work well! I made this for my family last night and we all loved it! 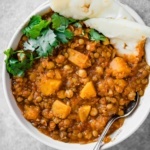 A very warming curry with lots of nutritious vegetables…it went down a treat! Thank you for this fabulous recipe! Amazing! I’m so glad you guys loved it. Absolutely delicious!! Thank you for the recipe. You bet! Glad you enjoyed. Love it! So glad you enjoyed. Glad you enjoyed it! Perfect for dinner. Yes it is but minus the pumpkin. I just made it tonight and was looking up the recipe for nutritional tracking and the recipe matches up exactly. Hi! Just ran out of coconut milk. Can I use yogurt instead? Hi Angela! I would not recommend it. Coconut milk has slightly sweet flavor and a creamy texture.